This month, I’m celebrating the sweet potato — our official state vegetable. With North Carolina being the Number 1 sweet potato producing state in the country, this versatile root vegetable is a fundamental southern food, finding itself on many a menu throughout the state and walking the diverse flavor profile line between sweet and savory. 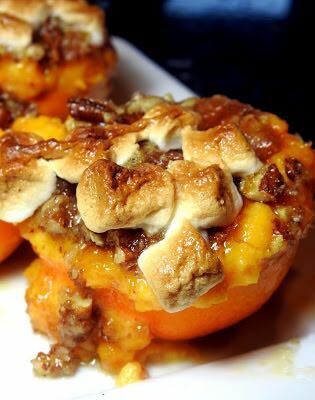 Today, I have two sweet potato recipes for you — one savory and one sweet. Prepare the potatoes, Hasselback-style. 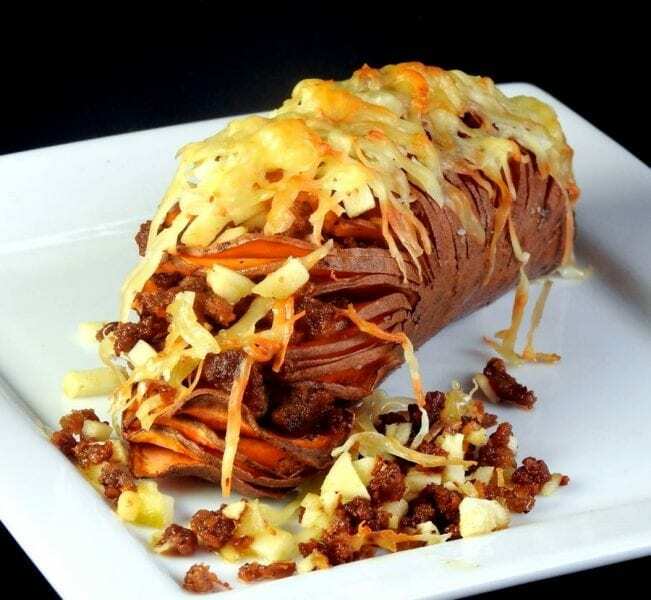 Hasselback-style is a Swedish method of preparation in which the potato is very thinly sliced, accordion-like, without cutting all the way through the potato. Liberally apply butter to the potato, on the outside and in between the slices. Sprinkle with kosher salt. Bake potatoes in a 350° oven for 50 or so minutes, until potato is tender. Throughout baking, spoon the melted butter over the potatoes, gently separating the slices. While potatoes are baking, cook sausage in a medium skillet, breaking the pieces into crumbles. Drain on paper towels. Add minced apple to the sausage. 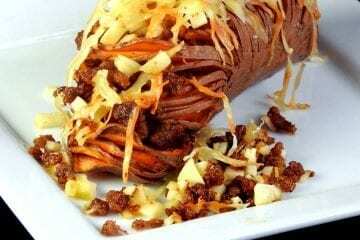 When potatoes are cooked, add sausage mixture in between the slices. Top with grated Gruyère cheese and run under the broiler until cheese is melted and slightly golden brown. Peel and chop the sweet potato. Cook potato in boiling salted water until tender. Drain. Transfer sweet potato pieces to a medium bowl and add in a tablespoon of unsalted butter. Mash until butter is melted. With electric mixer, beat in vanilla, egg, and a tablespoon of cream at a time until creamy smooth. Season to taste with kosher salt. Halve oranges and scoop out the segments. I hold the orange over the sweet potato mixture to collect any juices that drip out. Eat the segments. Scoop the sweet potato mixture into the orange cups. and ½ cup coarsely chopped pecans. Spoon mixture over filled orange cups and top with mini marshmallows. Bake at 325° about 20 minutes until heated through and marshmallows are melted and lightly browned.